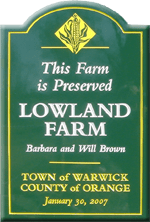 Our farm is a mixture of rolling upland pastures and woods, and bottom land (“lowland”) along Pochuck Creek, part of the Walkill River system, which flows north into the Hudson River. It is bordered by a large area of undeveloped land that stretches south to the Appalachian Trail and Wawayanda Park, and is home to a wide range of wildlife in addition to our cattle. If you have a question, would like to place an order, or want to make a comment, please do so using the Contact Form, below. We’ll get right back to you. Thank you!